Did Hetty scare off all the dogs??? 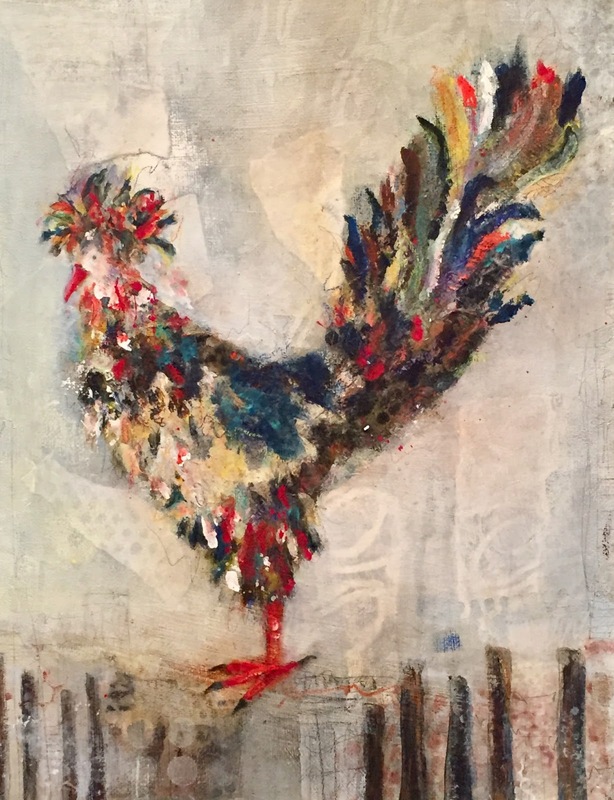 Here is what I absolutely LOVE about this painting: the way the veiled collage brings movement and story to an otherwise 'still' life—the brighter white pieces behind Hetty's head and in front of her tail feathers suggest back and forth movement, their straight edges indicating to me the 'jerky' movement I associate with hens; the speckled collage in front of Hetty's chest suggest the up-and-down movement of pecking for food; the scribbles behind her feet suggest the raising of a foot to scratch an itch. The various-sized circles collaged in front of/beneath Hetty's feet suggest there's fruitful pecking to be done! No - I think I scared the dogs!! Needed to take a step back from those dogs and regroup. Have always liked the chickens - would love to have chickens, but I don't need to provide the wildlife with a free meal! You see so much more than I do - so I will be going back and taking a closer look! I just spent a few minutes watch the crows outside. One perched on top of a small pine, posing majestically, and then I open Hetty. Birds are so funny and interesting. And your's takes the cake. I love the scummbly, ruffly, disheveled appearance. Sort of suits this lazy Saturday morning. Dotty said it better (but of course ;) but your hazy, busy, patterns and highlights in back suggest movement and action. My eyes have fun "darting" here and there to take it all in. Amazing to me, that for a scene where nothing is happening, there is so much lively, colorful "activity". 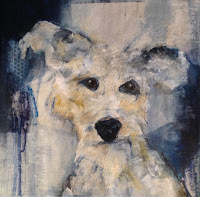 Her tail and head make me feel like she is ready to break into dance ;) You never know ;) LOVE your work Janet! Thank you so, so much Sheila. I enjoy what you have to say as much as what Dotty has shared! And I appreciate you taking the time to write. There is just something about chickens that I find the majority of people like . Glad she has brought some joy! Love chickens and dogs and cats. We have a hen visit our yard when I feed the yard cats, Bella. Not as colorful as your hen! bella goes straight to the cat's food till I bring out her seeds. Colorful and proud she stands! Lucky you Carol! Dogs, cats and a visiting hen. I think the hen knows a soft touch when she sees one. Have you ever painted her?